Home » Coast to coast » Salute Black Lives Matter activists who disrupted Trump rally in Virginia. Racism can’t be voted away. It must be shut down! Salute Black Lives Matter activists who disrupted Trump rally in Virginia. Racism can’t be voted away. It must be shut down! 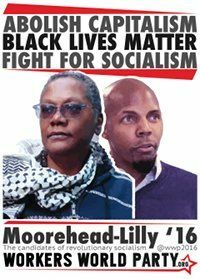 The following is a statement from Workers World Party 2016 candidates for president and vice president, Monica Moorehead and Lamont Lilly. We salute the dozens of Black Lives Matter activists who marched through a hostile, overwhelmingly white crowd chanting “Black Lives Matter” at a Trump rally in Radford, Va., on Feb. 29. These brave Black, Brown and white activists completely shut down the Trump rally for an uncomfortably long time. We send them our love and support. Like all activists who have disrupted election campaign events of the major capitalist political parties, these BLM soldiers demonstrated that the people cannot leave it up to the capitalist political establishment or the capitalist media to expose and smash racism, sexism and the oppression of lesbian, gay, bisexual, transgender and queer people. 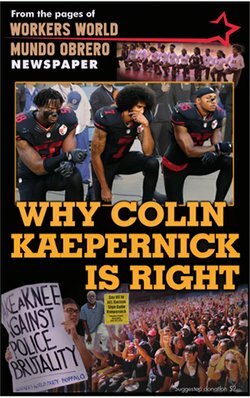 Most of the time, the capitalist establishment and its political parties and mass media generate and legitimatize bigotry because their system needs it to oppress, terrorize, kill, incarcerate, and divide and conquer. It is hypocritical that the media are acting so surprised and alarmed over white supremacists supporting Donald Trump. If the anti-racist movement has learned anything from past experience, it is that we cannot rely on the system to expose or stop the Ku Klux Klan or other white supremacist, terrorist groups. The truth is that the system uses these groups when it serves their purposes. Black and Chicano/a youth in Anaheim, Calif., just this past weekend militantly resisted the KKK and were victorious. We call on all those who truly want to make the world a “No Bigotry Zone” to expand the disruptions. Racism can’t be voted away — it must be shut down. It is especially important that our white sisters and brothers join in, so that the task of shutting down racism does not fall exclusively on the backs of people of color.